There aren’t really all that many games that fully feature American cities. At least, not that many that I can think of as I’m sitting here typing this way too late at night. We’ve got all kinds of games that celebrate specific European culture, reflecting the architecture, food, or people from specific cities. But are there really American versions of such games? Well if there wasn’t before, there is now in the form of Big Easy Busking from Weird Giraffe Games. Designed by Joshua J. Mills, this game brings the music and style of New Orleans into your house and right onto your gaming table. You and up to four other players will seek to control different areas of the town by playing music. Because how else would an area control game based in New Orleans work? Yes, each player takes on the role of a group of street musicians trying to make the biggest impact in The Big Easy. This work is done by your musicians putting their energy (in the form of cubes) into different songs (in the form of cards). Players all start with three different songs, each with different energy requirements from the saxophone, drums, and trumpet. On a turn, players will seek to play these songs onto different locations in the hopes of having some influence. These locations also feature specific moods that represent the type of songs the people want to hear, and players receive a bonus if they’re able to match the mood of the song. Songs will play until the beginning of the player’s next turn, at which point they can decide to leave all of their energy cubes on the location card to represent their influence on that area, or if they want to take some of that energy back so that they can play more music at different locations. Players may also choose to use that energy to purchase new, more powerful songs that will allow them to be more influential in the future. Players continue to learn and play songs and gain influence until everyone’s energy runs out, at which point the round is over and the payouts begin. Every performer that reaches a certain level of influence at a location will get paid, but the player who has the most influence will receive even more money. Once the cash has been paid out, everything gets reset and prepared for the next round. After three rounds, the player with the most cash wins! The first thing that will pop out to you for Big Easy Busking is the artwork. The colors and the art style will quickly take your mind to New Orleans. I really enjoy the details inserted by the artists, like the way in which the song cards feature open instrument cases in the background, truly sticking to the street musician vibe. The iconography is also very smooth, and the one little issue I had with it (the order is different on the player and song cards) has already been addressed by the publisher and will be fixed in the retail copy. There are more details to the rules than what I wrote above, and so the game can be somewhat difficult to explain at the beginning. However, players will get the hang of things soon enough, and soon the delay during turns comes less from not knowing what to do and more with having so much to think about. Yes, while you may think a game about street musicians down on Bourbon Street should be laid back, Big Easy Busking is a very competitive area control game at its heart. Most of the tension in the game can be found in the management of your very limited energy and the playing of songs from the end of one turn until the start of the next. Whereas most games involve strategy before you make the move, this game hits you twice, as it forces you to decide not only where to play your song, but also whether you will leave that energy on the location as influence or take it back to your band to use on future songs. That second choice may feature a completely new set of circumstances by the time your next turn comes around, as other players may try to also influence your target location, or maybe even try to gain more influence in a different location that you thought you had secured. All of this tension escalates as the game progresses into the later rounds where more locations are added and players have more powerful cards in their hands. So why should you get your hands on a copy of Big Easy Busking through their Kickstarter? Is it because of the amazing New Orleans theme? Well, I don’t think so. Don’t get me wrong, the artwork is great and very reminiscent of that city. But I think it’s somewhat disconnected from what you’re actually doing. As I mentioned, this was a high tension game for us, and players were developing four- or five-turn plans that could be thwarted by one sneaky move from an opponent. We actually started playing some jazz music at the beginning of the game to enhance our gaming experience, but eventually, players were asking for it to be turned off because they couldn’t focus. When I first received the game, I was thinking we would have the feel of a high-energy Bob Ross: The Art of Chill – something where we have a fun, lively, and laid back good time, just as I imagine for a town called “The Big Easy”. That was not what I found it in this box. While the theme may have missed the mark for me, the mechanics certainly didn’t. I’ve never used this as a compliment before, but Big Easy Busking is a game that we didn’t want to play again right away because, though we had a good time, we were so mentally exhausted. That’s not something I expected from a deck of cards and some cubes! We were frustrated with each other, but not in the way you get when someone does a cheap, backstabbing mood, but in that way of respect when you see that an opponent has executed on a really good plan. That’s why I would recommend this game for more gamer-y gamers and not necessarily for more casual gamers or most children. While the artwork might be enticing, those with less experience in the genre might walk away a little shellshocked. This game could also cause a tremendous case of analysis paralyis, so bring it to your gaming group at your own discretion. There are more complex area control games out there. 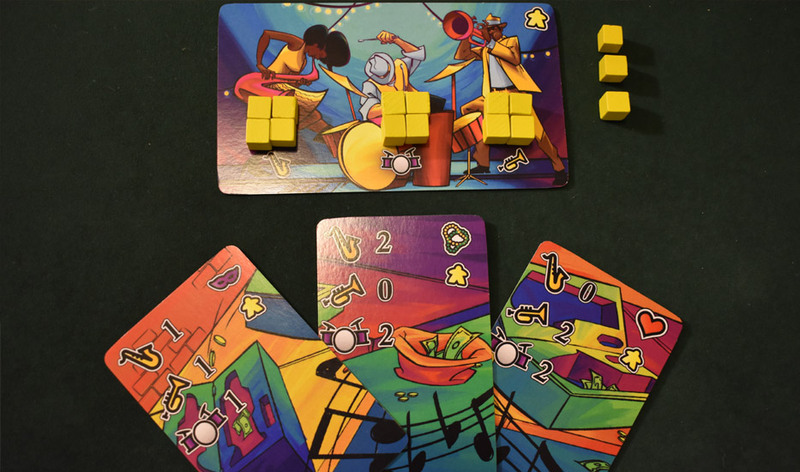 But Big Easy Busking has taken some solid mechanics from that genre – and added a few twists of its own – and created a game that overachieves. You’ll be surprised at the depth of the experience you’ve had from such a humble box. I mean, as humble as a box this colorful can be. The Kickstarter for Big Easy Busking launches on February 11th. Head on over and your reserve your copy today! Weird Giraffe Games provided us with a prototype copy of Big Easy Busking ahead of the Kickstarter campaign. This in no way influenced our opinion of the game. Previews are a glimpse into an upcoming game with the pros and cons that we experienced prior to production of the game.